Fishtail braid + updo tutorial..
Hey everyone! During Mercedes Benz Fashion Week Swim in Miami, I promised I would share how to do the awesome hairstyles I got to learn with the amazing TRESemmé team, both stylists, Tyler Laswell and Marco Peña. I’m going to start this small series of video tutorials with this awesome-and easy to do- fishtail braid updo inspired by the look seen from the runway at the Beach Bunny show. You only need two TRESemmé products, bobby pins, and an elastic. Prep hair against heat styling damage by misting on TRESemmé Keratin Smooth Heat Protectant Shine Spray that will also seal in shine for this hairstyle. Smooth on drops of the TRESemmé Keratin Infusing Smoothing Serum to additionally help eliminate frizz during straightening. Blow dry hair. To get the perfectly sleek look for the fishtail, straighten hair with a flatiron. To do the fishtail braid: Divide hair into two big sections. Take one smaller piece of hair from the far left side and cross it towards the right. Now repeat with the other side- take a smaller piece from the far right side and cross it toward left side. Repeat this until the end and secure with an elastic. To create more texture, open the braid with your fingers. Leave down or create an updo if you want to. 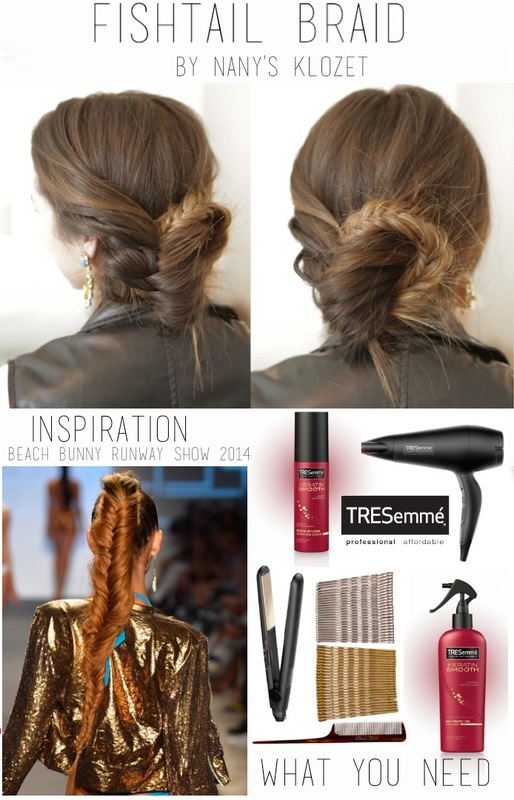 You can be as creative as you want for the fishtail braid. What we did was twist the hair underneath and hide the ends inside the beginning of the fishtail braid. Secure with bobby pins and you are ready to go! Hola a todos! Durante la Semana de la Moda de Miami, les prometí que iba mostrarles video tutorials de los peinados que aprendí junto al incredible equipo de TRESemmé y sus estilistas: Tyler Laswell y Marco Peña. Voy a empezar esta serie de videos con una moño fácilisimo de hacer con una trenza de espiga o tambien llamada cola de pescado. Esta fue inspirada en una de las pasarelas, Beach Bunny. Solo utilizamos dos productos de TRESemmé, horquillas, y una cola/goma/elástica. Empieza protegiendo tu cabello con TRESemmé Keratin Smooth Heat Protectant Shine Spray- que no solo protégé tu cabello del calor sino tambien ayuda a darle brillo a tu cabello.. También puedes aplicar unas gotitas del TRESemmé Keratin Infusing Smoothing Serum para eliminar el frizz mientras alisas el cabello. Seca tu cabello como lo harías regularmente. Para obtener un look extremadamente liso, utiliza una plancha. Para hacer la trenza de espiga: divide tu cabello en dos partes. Luego agarra un mechon pequeño del lado izquiero y pasalo al lado derecho. Repite del otro lado: agarra un mechón pequeño del lado derecho y pásalo al derecho. Repite esto hasta el final y amarra la trenza con una colita. Para darle más textura a la trenza, abrela con tus manos. Para el recogido puedes ser tan creative como quieras. Lo que nosotros hicimos fue girar la trenza por dentro y esconder las puntas en donde empieza la trenza. Sujeta el moño con horquillas y listo!! Espero que les haya este tutorial. Recuerda que puedes ver más videos en el canal de TRESemmé (www.youtube.com/user/TRESemme/Home). No olvides compartir fotos conmigo via instagran en dado caso que intentes este peinados! ¡Abrazos! Disclosure: This post is sponsored by TRESemmé, a product by Unilever. All opinions are my own and I truly support and trust in the products mentioned above"